Enjoy this recipe release from our new book Trim Healthy Table. While Trim Healthy Table is full of easy, family-friendly recipes like casseroles, skillet meals, crockpot, and electric pressure cooker meals, etc… its largest chapter is the Soup chapter. That is for good reason! Studies show that broth-based soups powerfully slim you down! Our soups harness all the power of broth-based soups but smash the “diet” stereotype they carry to smithereens! All the soup recipes in Trim Healthy Table allow you to eat big, hearty bowlfuls. These soups are not starters to your meal… they ARE your meal and they leave you and your family feeling nourished, nurtured and full to the brim! 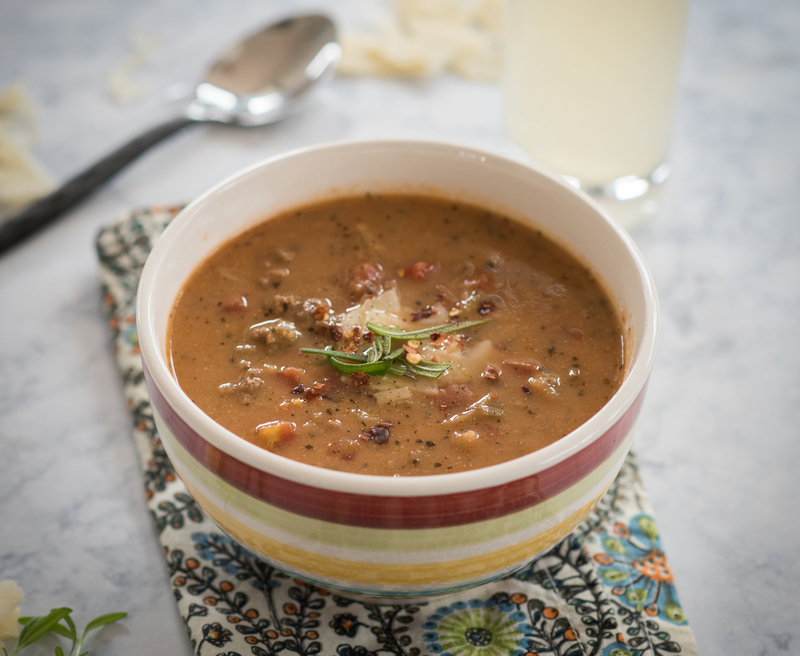 Here is a delicious Italian-version of the Trim Train Taco Soup we developed for Woman’s World magazine, which they called “Secret Ingredient Soup”. They asked us to come up with an ultra-slimming, ultra-tasty soup they could publish for those just starting our plan to help make the beginning of their Trim Healthy Mama journey easier. We developed the taco version and it was a hit! Trim Train not only helps THM beginners have a quick meal to fall back on when they are just starting and feeling overwhelmed, but it has also helped many of our seasoned Trim Healthy Mamas get through weight-loss stalls and simplify their weekly menus! You can find the original recipe on our website TrimHealthyMama.com. Our Head Admin for the official THM Facebook groups, Jessica Myers, came up with this Italian-version. This recipe can be found in the All-in-One Meals section of the Trim Healthy Table cookbook on pages 160 and 161. Brown the meat in a large soup pot. (*If the meat you are using is not at least 96% lean, brown the meat and then place the crumbles into a colander. Rinse well under very hot water to release all the fat. Return the meat to the pot.) Add the seasoning blend and garlic, and saute with the meat until the veggies thaw and begin to tenderize. Add the chicken broth, seasonings, diced tomatoes, tomato paste, and tomato sauce and let simmer. While the soup is simmering, put the frozen cauliflower florets in a blender with 3 cups of the boiled water and puree until perfectly smooth (if you have a small blender this may require two batches). Add the creamed cauliflower to the soup pot. Put the frozen okra in the blender with the remaining 4 cups boiling water, the gelatin, and coconut oil. Blend well until completely smooth and creamified. (Blend, baby, blend! There should be no little bits of okra left.) Add to the pot and simmer for another 15 to 20 minutes. The longer you simmer, the less you will notice any signs of okra at all. Taste test to “own it.” You may want to go heavier with the seasonings, but it’s up to you. For the weight-loss plan, enjoy a couple big bowlfuls as written for a FP. Top with grated cheese for an S or add a side salad with a creamy dressing. To make this an E, either add some cannellini beans to the soup or have sprouted grain toast or 2 or 3 Wasa Light Rye crackers on the side with a thin smear of butter. Growing children or others at Crossover stage can top this with grated cheese and include the beans, bread, or cracker items to merge carbs and fats. This makes 12 ginormous servings or 14 large servings. Dish up half of this soup as a hearty dinner to feed a family of 6, then set aside the rest for quick single-serve meals throughout the week. It will easily last 5 to 7 days in the fridge, but it also freezes well in individual portions. Use an unflavored grocery store gelatin if you want to make this soup and don’t have the THM Just Gelatin. The Trim Train Italian Soup recipe and other delicious THM recipes can be found at www.TrimHealthyMembership.com.